HomenewsAgencyGoogle OptiScore or Optimization Score – More action, more insight, and less manual. What more can we ask for? Google OptiScore or Optimization Score – More action, more insight, and less manual. What more can we ask for? Whether you’re new to paid search or an expert with 10+ years of search experience, Google OptiScore was created to assist all marketers from different backgrounds. Quickly learn how to save time and understand how Google is favoring or penalizing your account. For many of the experts out there, we pulled countless reports and QA documents to ensure all levers are functioning properly. 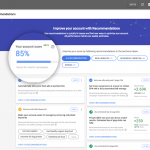 Since OptiScore rollout in 2018, more advertisers are starting to take advantage of the tool. Below, we’ll discuss how OptiScore functionality, Google’s advocacy, and utilization of this powerful tool. Before diving any deeper, I want to add the caveat that not all OptiScore recommendations should be applied. Carefully consider each optimization as it may not always be the best fit for your objectives and needs. The OptiScore updates in real-time as soon as you click “Apply Changes,” the account updating in real-time so you know where you stand on a scale of 0-100%. The variation of recommendations ranges from budget/bid management to ad copy to an extension to standard repairs. The following tips tend to improve the account’s health by a significant margin versus OptiScore recommendations. Why is Google advocating these recommendations over others? It’s very simple: Google is asking for the maximum variable inputs to test and learn. Dynamic Search Ads – This is similar to broad match keywords as the tool uncovers keywords based on contextual keywords from webpages. Dynamically serve relevant ads based on content from the site. Responsive Search Ads – The input of 15 headlines and 4 descriptions allow the algorithm to optimize towards the best performer; advertisers possess great control to pin specific headlines, ensuring your brand name appears first for brand searches. This means we’ll lose some control, but it is inevitable and virtually impossible to outrun the speed – an increasingly important factor to consider. Test quickly and learn what resonates amongst your audience segments. What I find most helpful? Human error is natural and is here to stay, hence why intertwining conflicting negative keywords is inevitable. Fortunately, OptiScore catches your oversights. As advertisers, we never want to drop the ball. Here are some quick hacks to easily find the pitfalls in your campaigns. Before implementing Dynamic Search Ads, understand your ad copy is simply reflective of the user’s query & landing page. In turn, ad copy may not align with core brand messaging. We hope Google will roll out with the same features for YouTube, Display, and contingent ad types. Currently, the tool only analyzes paid search campaigns. Bid recommendations and audience suggestions for YouTube and Display would be the ideal start, taking into consideration reach, frequency, and site engagement. 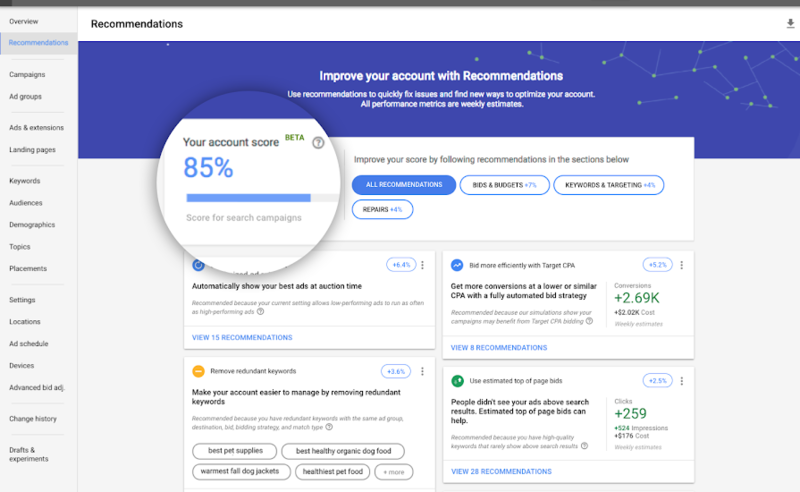 Continued, automated machine learning within the Google tech stack will be interesting to see OptiScore recommendations based on its integration with Google Analytics. Do you use Google Opti-Score on a regular basis? Tell us what you like and don’t like?